Teacher, political activist and founder member of the ANC Youth League. Ashby Solomzi Peter Mda was born on 6 April 1916, in Herschel district, bordering Lesotho. He was the first son of Mildred Mei, a school teacher and Gxumekelana Charles Mda, a headman, peasant farmer and shoemaker in their district (Herschel). Peter and his siblings attended a local Catholic school despite their parents being devoted Anglicans. From his local school, Mda proceeded to further his studies at the Catholic institutions of St Francis in Aliwal North and Mariazell, northeast of Matatiele. After he qualified as teacher, Mda struggled to secure a teaching job in the Eastern Cape until he settled for a menial work as gardener and kitchen boy in a White household in East London. In 1937, he set off to the Witwatersrand with the hope of landing a teaching post, but he found teaching jobs as scarce as in the Eastern Cape. At the Witwatersrand Mda first continued to work as gardener and kitchen boy and then at a steel foundry until he found a teaching job at the Germiston Catholic Primary. In 1938 he moved to another primary school, called St John Berchman, in Orlando Township, Soweto. Mda cut his teeth in politics when he attended the All-African Convention meeting in Bloemfontein in mid-1936. He covered the proceedings of the meeting for an East London-based newspaper, Umlindi we Nyanga. The meeting left an indelible impression on him. ‘The Giant Congress', he reported, ‘marked a definite epoch in the history of the Africans' who were ‘turning a new page in the history of their development, if they can work with such oneness of spirit in laying their plan campaign.' Mda defended the AAC vehemently when its leadership, led by its president D.D.T. Jabavu, was suspected of and criticised for betraying their mandate by cutting a deal with Hertzog about the Hertzog Bills of 1936. When AAC support dwindled towards the end of the latter part of the 1930s, Mda began to advocate African Nationalism, which according to him should not depend on an alliance with non-African groups. He was disillusioned by the AAC and the 1936 laws, which hindered African personal advancement and promoted segregation along racial lines. With this status quo Mda threw his support behind the newly appointed President Dr A.B. Xuma of the African National Congress (ANC). The ANC was at this time reviving itself. Mda believed that the ANC was the only independent organisation that could advance the concept of African Nationalism. On African Nationalism, Mda warned that the concept should not be used to justify African acceptance of a segregation and separate development path. The Catholic Church prepared Mda to be anti-communist. He had misgivings towards the Communist Party of South Africa (CPSA). He believed the party's intention was to infiltrate and take control of the ANC. Though he was anti-communist, Mda read most books dealing with communism, including Marx's Das Kapital, Engels's Anti-Duhring, Trotsky's The Revolution Betrayed and Laski's The Grammar of Politics. He participated in the African teachers campaign spearheaded by the Transvaal African Teachers Association (TATA) for higher wages in 1940. The following TATA meeting at Wilberforce Institute constituted a Salary Campaign Committee, comprising of Mda as chair, of TATA Pimville branch, David Bopape, Edward Manyosi, M. Maubela, M. Kekana, Sydney Maseko and E.S. Molepo. His support for teachers was risky since he was also a member of the Catholic African Teachers Union (CATU), which deemed teaching as a vocation, and was opposed the wage campaign. But he was prepared to take on a priest publicly. Mda and other young teachers viewed the wage campaign as a turning point in their lives. He played a significant role in the formation of the ANC Youth League. He was a devoted Catholic and staunch anti-communist. When Lembede arrived in Johannesburg to serve articles at Seme's law firm, Mda struck a political and intellectual partnership with him. Mda, who was politically mature, tutored him in fine politics and ANC culture. Together with Lembede and Jordan Ngubane, assistant editor of the Bantu World, he was mandated by the ANC Youth League to draw up the manifesto. 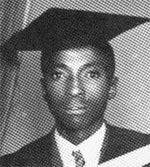 In 1947, Mda pursued a BA degree through correspondence at the University of South Africa (UNISA). Following Lembede's sudden death on 29 July 1947, Mda was named acting president of the Youth League until he was formally elected as president in 1948. Because Mda was living outside Johannesburg, he periodically made a trip to catch up with new developments in the Youth League. He later set up a working committee, comprised of Nelson Mandela, Walter Sisulu and Oliver Tambo, to oversee the activities of the League. Though the League managed to establish branches in Natal and the Cape Province, Mda perceived Fort Hare as a target for the Youth League to expand its influence, given its Black student community. Mda contacted Godfrey Pitje, lecturer at the University, to pursue his conviction. The Fort Hare branch was finally launched in November 1948. Under Mda's leadership the Youth League presented the Programme of Action (PA) at the ANC's Cape provincial conference held in Port Elizabeth in June 1949. The conference adopted the PA with slight changes in wording. As Xuma's term of office was ending, Mda and other Youth League members sought a presidential candidate who would endorse the PA at the forth-coming ANC national conference in 1949. Oliver Tambo, Mda's deputy, who was absent from the conference because of ill health, dashed off to James Moroka's home in Batho location to pursue him to stand for election. After Moroka's election to the presidency, the PA was adopted by the conference as the ANC's guiding document. A.P. Mda died on 7 August 1993 in Bloemfontein of heart failure. • Dubow, S & Jevees A. South Africa's 1940s World of Possibilities, ABC Press, Cape Town.